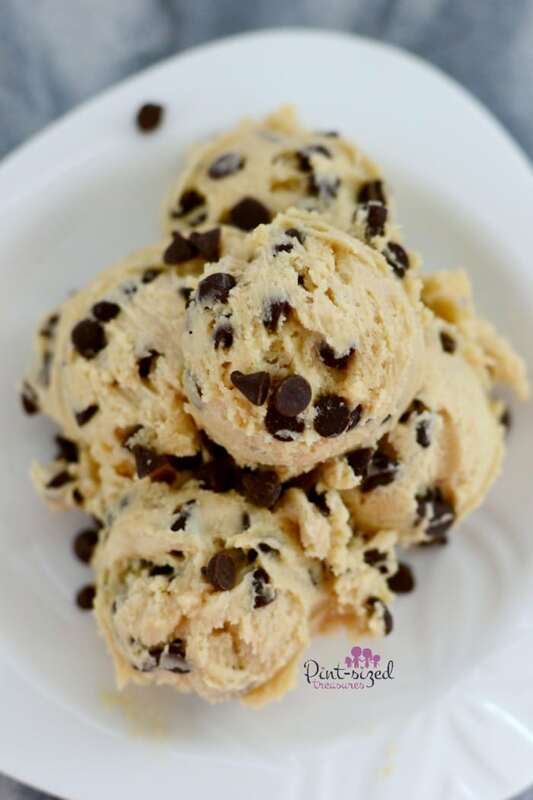 Edible cookie dough…it’s a treat that moms and teens can completely connect over. Even in a world with keto and kelp fanatics! For sure we should eat healthy, but what’s life without cookie dough and super-soft Nutella cookies. I don’t want to live in a world without those two. Just sayin’. Did you hear there was a shop that sales cookie dough by the scoop in NYC? It’s on my bucket list to do! I definitely want to try one of each of their variety of flavors. Back to the truly unique store in NYC. It’s called DOH. Be sure to stop by when you’re in the neighborhood! 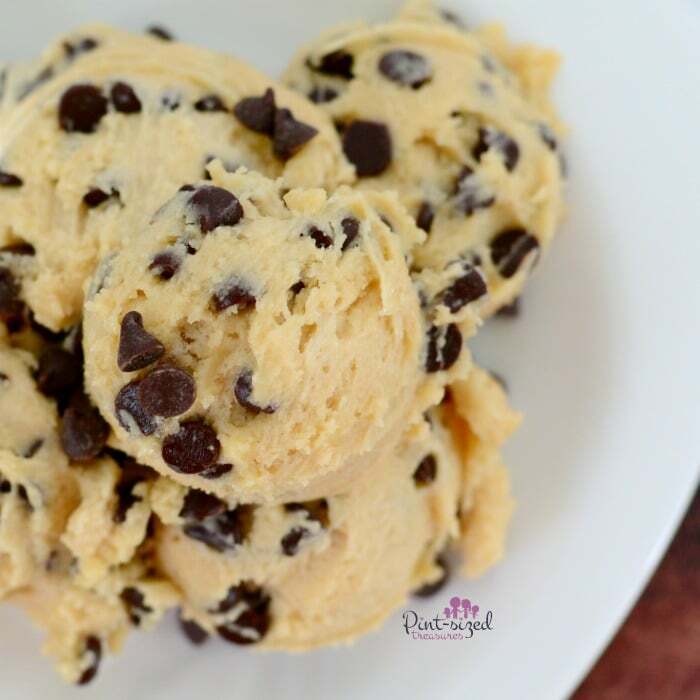 <3 But Let's chat about our homemade version of edible cookie dough. This is a fun treat I like to make for family nights, birthday parties or a weekend treat. 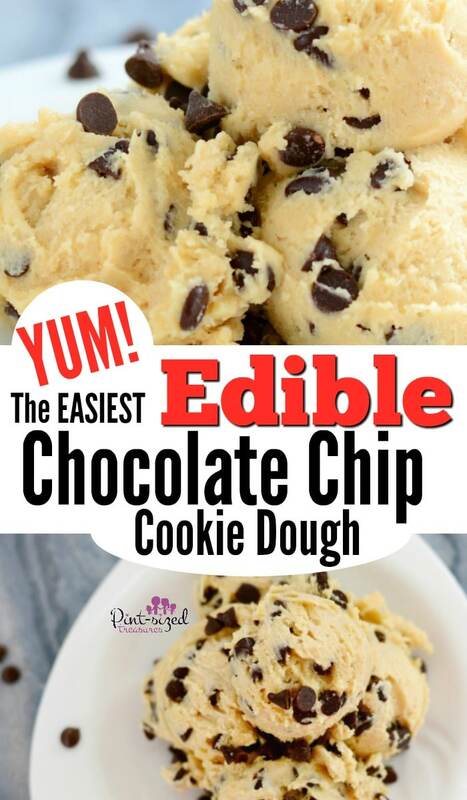 Creating my own edible cookie dough also helps my kiddos stay out of the unsafe cookie dough when we’re baking cookies! And you can definitely make this in bulk, freeze it and use it later to make your own chocolate chip cookie dough ice cream! And you can also try this chocolate chip cookie dough pizza when one cookie dough dessert just won’t do! I prefer making my own anyway because I always feel ripped off when I buy pint of cookie dough ice cream and there’s only about ten pieces cookie dough in it. 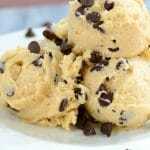 You can easily make cookie dough bites by pinching off the edible cookie dough in this recipe, rolling it into tiny balls and then freezing it on a parchment lined cookie sheet util firm. Once the tiny balls of edible cookie dough are firm, you can toss them in a large freezer storage bag for emergency stress eating days. To make this recipe super safe and edible, be sure to “heat treat” your flour. There’s always a chance that your flour is contaminated, so “heat treating” is a must for our family! That’s the simple term used for pre-baking flour for no-bake recipe. Spread out the desirable amount of flour onto a cookie sheet. Bake the flour in a 350 degree oven for ten minutes. Doing this “heat treatment” help kill off any bacteria so you can enjoy a safe, edible, super yummy cookie dough recipe! Oh, and I highly recommend using mini chocolate chips in your cookie dough. They’re so tiny and cute, but more importantly when you use the mini version, you get more chocolate in every bite! Hey, if it’s chocolate, it’s going to be a good cookie dough! Go ahead and make this super simple recipe to celebrate anything wonderful happening in your life! 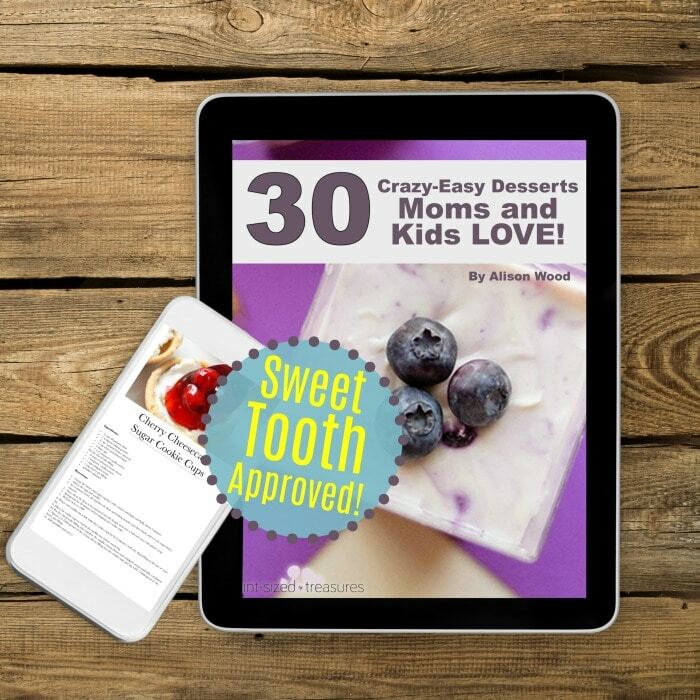 And if you have a sweet tooth, you’ll love our CRAZY-EASY DESSERTS Book that’s written especially for busy people involved who need an amazing dessert — FAST! 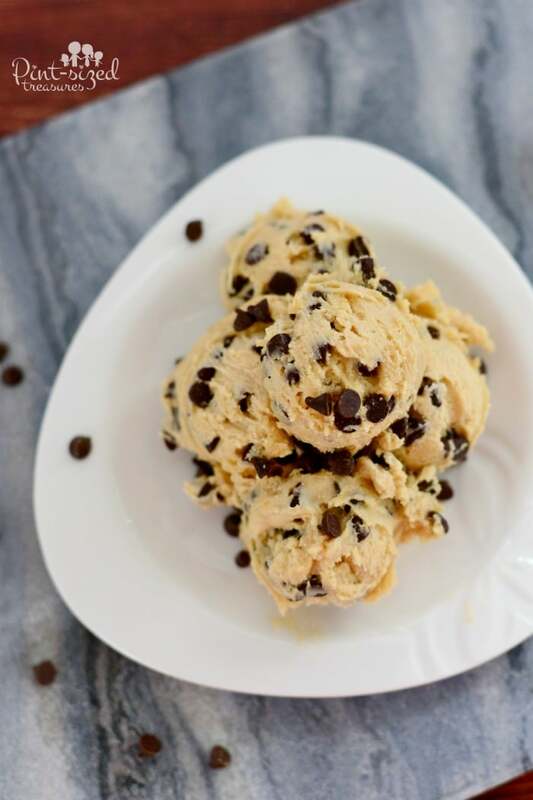 Super simple, edible chocolate chip cookie dough is perfect for any day worth celebrating! 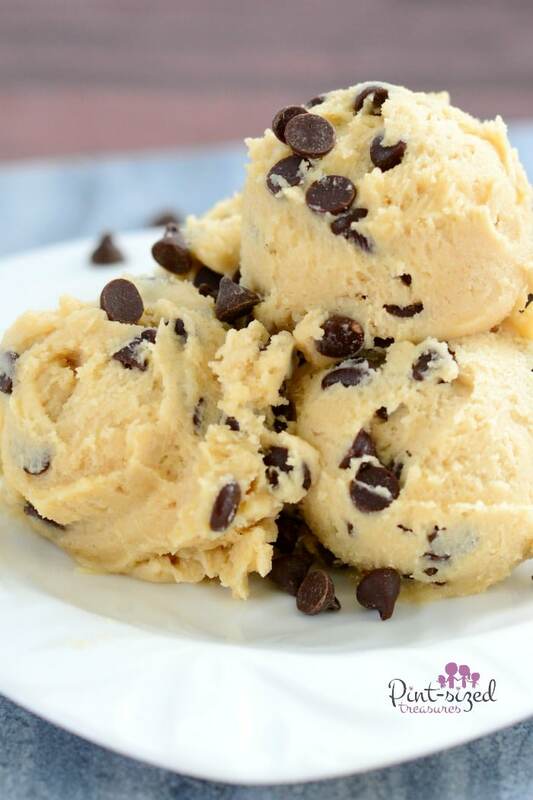 Super soften scoop able,you'llbemaking this recipe every time you get a craving for edible, safe cookie dough! Spread flour on cookie sheet and bake flour 5-10 minutes to "heat treat" it. Mix in salt, flour, milk and vanilla. Refrigerate one hour before serving so it's scoop friendly!